Since the abduction of more than 200 schoolgirls on April 14, the Nigerian government has been struggling to determine the best way to locate the kidnappers and their hostages. Both U.S. and Nigerian officials have been blamed for their lack of action regarding Boko Haram, the militant group that abducted the girls, and President Goodluck Jonathan has been accused of knowing about the approach of Boko Haram hours before they arrived at the school. In part because of their failure to prevent the kidnapping, the Nigerian government is under immense pressure from Nigerians and those abroad to locate the missing girls and return them safely to their homes. Many solutions are being thrown around, but here are the serious options the Nigerian government could take. McCain is more excited than most, however, to interfere military. In a press conference Wednesday, Press Secretary Jay Carney said that U.S. officials are “mindful of where we are in this process” and urged Americans “not to get ahead of ourselves.” Carney said any military personnel deployed in Nigeria would be there in an “advisory capacity.” So far, about thirty American specialists from the FBI and the Pentagon are in Nigeria, advising the Nigerian government, but American military is not being deployed in the search. The area the girls are thought to be in is very large — approximately the size of West Virginia, according to Carney — so any efforts to find the girls will be difficult. The U.S. could also send military equipment to help the Nigerian army, but this decision, too has proved controversial due to the Leahy Law, which prevents the U.S. from aiding foreign armies that have been accused of human rights violations. While the U.S. mulls things over, Canada has decided to help the Nigerian army stock up. The Nigerian military is very corrupt, and has been cited by Human Rights Watch for engaging in human rights violations in previous altercations with Boko Haram. In earlier clashes with Boko Haram, the Nigerian military has wrecked villages and left innocent Nigerians homeless. These conflicts have not been very effective at managing Boko Haram. President Jonathan has said that since 2009, Boko Haram has killed about 12,000 people. According to some villagers living near the Sambisa forest, where the girls are thought to be held, there has been no Nigerian military presence in the area thus far. A Nigerian soldier recently told international press that the army is ill-equipped and underpaid, and that morale is low. He said that the weapons of Boko Haram far surpass those of the Nigerian army, and that soldiers are only given 60 bullets before being sent out to fight the terrorist group. Rumors have also surfaced that some members of the Nigerian militia actually sympathize with Boko Haram and sometimes fight alongside them. 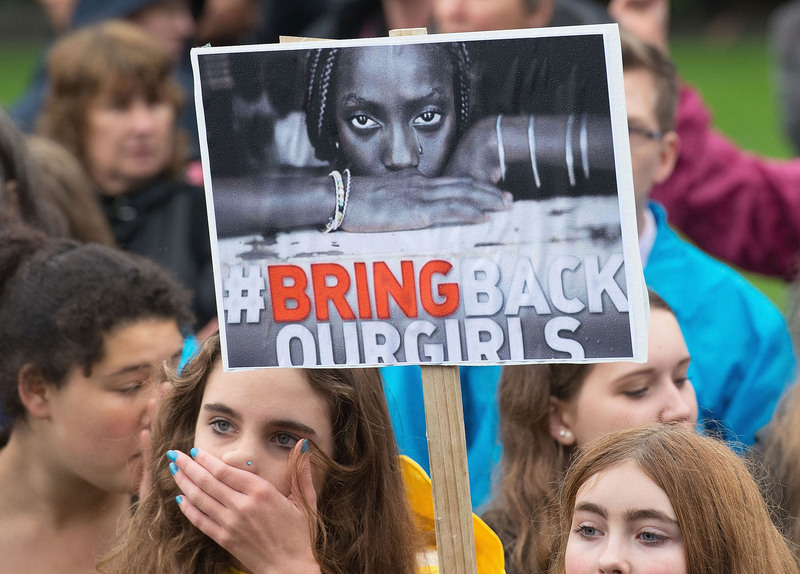 According to the Associated Press, over 500 Nigerian hunters gathered on Sunday with homemade guns and spears to try to find the lost girls, asserting that their knowledge of the forest could supplement the Nigerian military’s efforts. The hunters told Associated Press reporters that they possess magical powers that render them immune to shedding blood, and give them military skill. They also stressed that they are waiting for the government approval to join the search effort, but hope to help the army. These hunters are not the first civilians to suggest looking for the girls, themselves. On April 21, Reuters reported that parents of the lost girls were looking for their daughters on motorcycle in the Sambisa forest, because they felt the government was not doing enough to find them. The UN has sent envoys to advise and aid to the Nigerian President in the search for the girls, but the UN Security Council, which includes a representative from Nigeria, has also threatened further intervention. The Council could impose sanctions on members of Boko Haram, but what exactly this would mean for a group already considered terrorists by most governments, is unclear. According to The Guardian, lawmakers in the UK recently discussed the relevance of UN intervention in Nigeria on the basis of the Responsibility to Protect Pledge. The Pledge, which was agreed upon during the 2005 UN World Summit, states that the international community “has a role [in] … the duty to prevent and halt genocide and mass atrocities,” regardless of a state’s sovereignty. This means that even if the Nigerian government refuses help from the UN, the UN may still be able to justify intervening.